IN THE BEGINNING, IN DENMARK ….. The story of Christmas seals began in a post office in Denmark one late Christmas night in 1903. A postal worker, Einar Holboell, wading through a huge mass of outgoing mail, thought: if people were willing to spend a little more to send their Christmas greetings through the mail, considerable income could be derived, which could very well be used for a worthy cause. 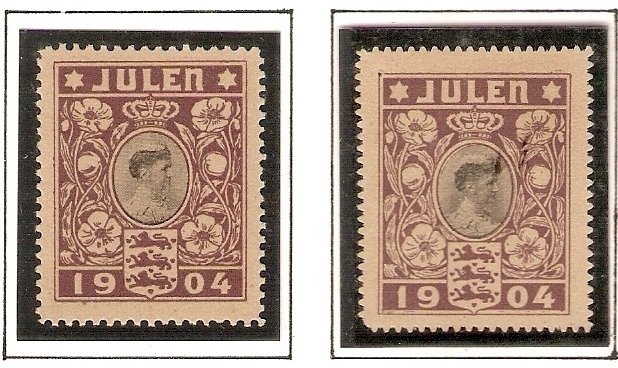 This meant the issuance of a special Christmas stamp or seal. Holboell’s superiors enthusiastically endorsed the scheme and agreed that funds earned could be used to build a hospital for children afflicted with tuberculosis, then considered a fatal disease. Denmark’s King Christian II approved the project and himself chose the seal design which pictured his recently demised wife, Queen Louise. Two Scandinavian neighbors, Sweden and Iceland, learned about the plan, and after consultations in Copenhagen, decided to adopt the idea. Thus, Denmark, Sweden and Iceland issued the world’s first Christmas seals in December 1904. The Denmark seals were a tremendous success: more than 80% of the 2 million seals printed were sold! It is not generally known that the Denmark 1904 seal were of two types: round perforated and with saw-tooth roulette. News of the eminent results of the Denmark Christmas “stamps” quickly spread out to other parts of the world. Argentina, Italy and the Netherlands issued their own Christmas seals in 1905, followed by Austria and Norway in 1906. The United States was not unaware of these developments. 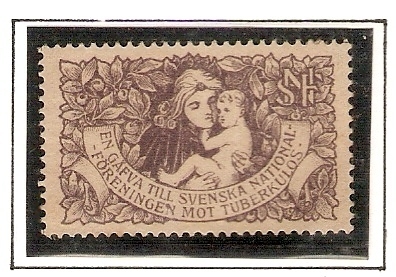 A Danish-American writer reported this in the press, and urged the US to follow this example in order to raise funds to control tuberculosis which was exacting a high toll of lives in the country. FOR THE MEANTIME, IN THE UNITED STATES…..
At about that time, a destitute TB shack in Delaware, USA, facing closure and needed just $300 to save it , appealed to a known social worker, Emily P. Bissell, for help. Bissell recalled the story of the Danish seals and decided to launch a Christmas seal drive to produce funds. When approached, both the American Red Cross and the US Postal Service declined to extend full support. Undaunted, Bissell herself drew the designs for the first seals, and with borrowed money, ordered the printing of the seals which she and some volunteers placed on public sale early December 1907. With proceeds dismally low, Bissell sought the help of Philadelphia’s leading newspaper for publicity but was rebuffed. Refusing to give up, Bissell talked with a senior reporter of the newspaper and desperately explained the urgent need for the seals. The reporter was electrified by her story and forthwith secured the permission of the editor to write about the seals. Thus for three weeks, powerful appeals for the seal and its noble purpose appeared on the front page of the newspaper. National interest was stirred and not too long after, $3,000 was raised, instead of just $300. The American National Red Cross assumed issuance and sale of Christmas seals in 1908, until 1920 when the National TB Association took over. In 1973, its name was changed to “The American Lung Association. AND, IN THE PHILIPPINES ….. In the meanwhile, halfway around the world, the Philippines was just recovering from the ravages of the Filipino- American war and was adjusting to the new focus on education and health under American rule. Shaken by an alarming disclosure about the exceedingly high TB mortality in the country, a meeting of concerned citizens and government officials decided to form the Philippine Anti-Tuberculosis Society in August 1910. In October 20, the Society approved the issuance of the Philippines’ first Christmas seals, and 500,000 seals were produced by the Bureau of Printing, Manila. In September 1917, the Society was appointed by the US National Association as its representative for the sale of Christmas seals in the Philippines. Thus, US Red Cross seals, and later, NTA seals were “officially” sold and used in the Philippines from 1917 up to the outbreak of the Pacific war in 1941. In 1940 and 1941, Elizalde & Co., an old and respected commercial company, issued its own private Christmas seals, which were given away free to the public upon request. Although non-TB, these seals are an important and integral part of the family of Philippine Christmas seals. About 1946, a crudely designed yellow seal appeared, unannounced and hardly noticed. While the texts “The Philippine / Tuberculosis Society” appeared on the seal’s face design, the Society never acknowledged issuance of this maverick seal. This seal, however, was listed in Green”s Catalog. The whole sheetlet of this seal, of 3 x 2 seals on tete beche format, with gutters between, is an extremely rare item. In 1947, the Society decided to start regularly issuing Christmas seals every year. The issues from 1947 to 1970, were printed in the US and Japan. From 1973, seals were produced exclusively by Philippine printers. Over the years, TB Christmas, New Year or Health seals have been issued by more than 100 countries worldwide. The Socialist countries - China, Cuba, Czechoslovakia, Hungary, Poland, Russia and others - phased out issuance of seals when their political systems underwent a change. Some others, for varying reasons likewise stopped issuing seals after a few years. A great majority of countries, however, including some which turned Socialist, like Yugoslavia, continued to issue these seals almost as permanent institutions.